Stock photo of wall mural on the side of a building in the town of Pincher Creek, Alberta, Canada. Wall mural on side of a building in the town of Pincher Creek, Alberta, Canada. 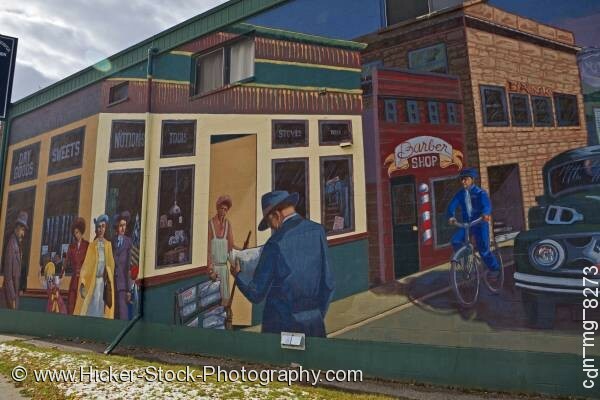 This stock photo shows a detailed wall mural on the side of a building in the town of Pincher Creek, Alberta, Canada. Painted on the side of a building in Pincher Creek is a colorful wall mural. The mural shows a street scene with people walking among the stores. On the corner a store sells sweets, dry goods, tools and other supplies. A barber shop sits between the corner store and an office building. An old vintage truck sits in front of the barber shop. A man rides his bicycle past the barber shop towards the corner store. A shop worker, wearing an apron, stands in the doorway of the corner store holding a broom. Another man is walking across the street as he reads his newspaper. Three women are walking along with a small child who is looking in the store at the corner. Wall mural on the side of a building in the town of Pincher Creek, Alberta, Canada.